Perhaps it was because I flew to South Africa just after New Year, and my brain was still addled with sherry, but I didn’t give a great deal of thought to my safari packing list. I just threw a handful of ‘adventure’ items into my bag and pointed myself towards Johannesburg for my month long trip to South Africa. 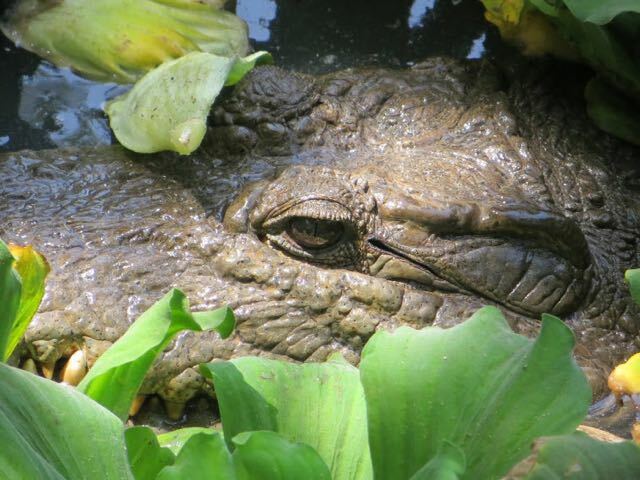 During that time, I took a safari in Kruger National Park where my lack of planning was quickly evident. On the first day, the guide sent me back to my room to change because I was wearing the wrong colours. 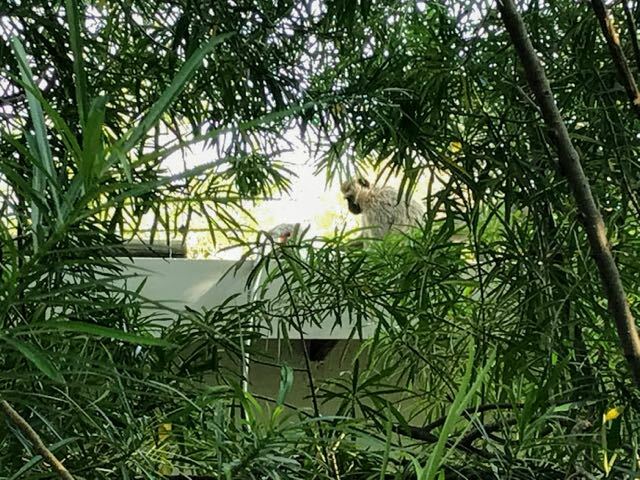 But that was nothing compared to having to crawl under my treehouse (where the snakes live, I was later informed) to retrieve my iPhone which I’d tossed into the air when a moth the size of a house (for real) flew into my hair, attracted by the phone torch. The laughter from my head torch, which was sat at home, was so loud I could hear it all the way from England. So, with the benefit of hindsight, here’s what you should pack for a safari. And, don’t worry, I’m not going to throw the kitchen sink in there. I’ve visited over 60 countries and while I’ve only taken a safari in two (South Africa and, randomly, Senegal), I’ve visited lots of developing countries and you will not need to pack your own water filtration system. I’ll also keep this safari packing list to the essentials only rather than including every last thing you should pack. I presume you know that you need to take your toothbrush and underwear, right…right? 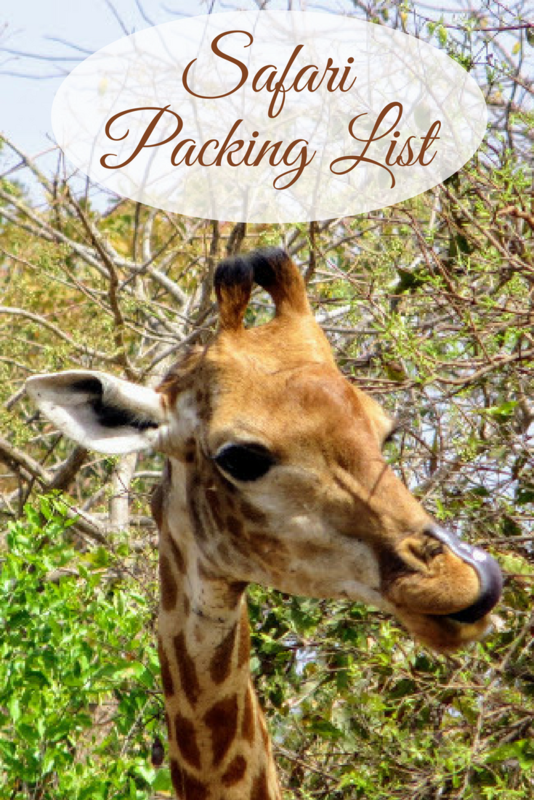 If you do want a full list of packing items (not just for safari), you can find my printable list here. 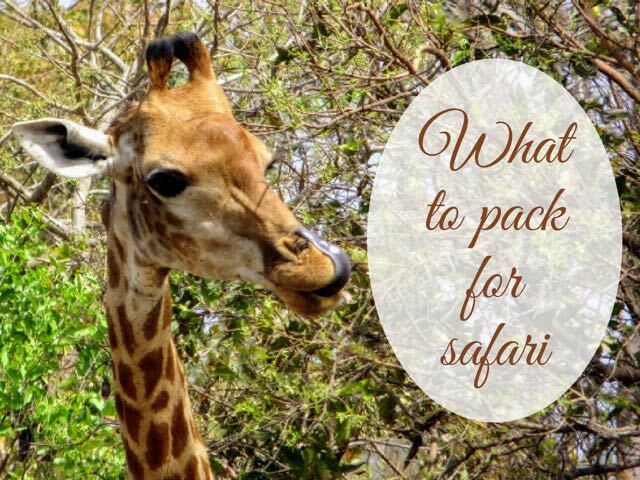 I have also included a printable version of this safari packing list at the end because I know from experience that packing is a lot easier when you can tick things off a list. 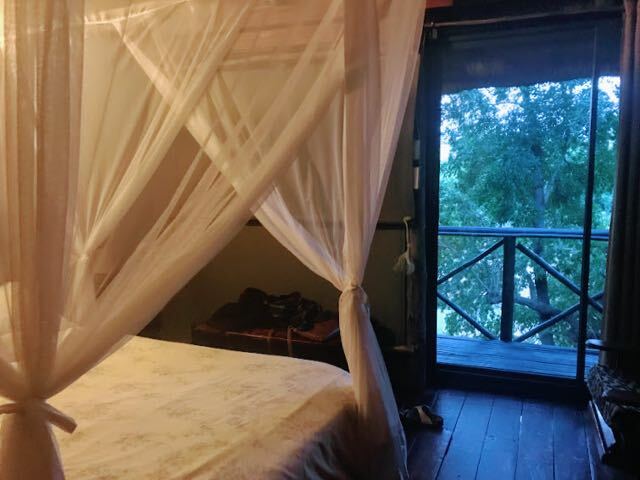 Bonus: if you want a list of the 5 things you don’t need to add to your safari packing list, you’ll find that at the end of this article as well. Let’s get stuck in. Here’s my safari packing list. Let’s deal with colours and materials first. You should aim for neutral colours – beige and khaki are popular. This will help you blend into the background, meaning the animals are less likely to see you and eat you. Just kidding. Run away from you. If you’re decked out it a mauve Hawaiian print shirt, you might scare the animals (and other tourists) away. A word on white: that time I got sent back to change – I’d thrown a wonderfully white scarf around my bright ensemble. When I asked if the bright colours were the problem, I was surprised to hear that the white was actually worse because of it’s brightness. It’s also worth noting that there will be plenty of people on your safari breaking all of the colour scheme recommendations. We had a bright teal fleece, white shirts, and a red t-shirt. You won’t be stopped from going on safari, you might just decrease your chances of spotting a leopard. As for materials, go for lightweight, breathable clothing e.g. linen and cotton. Yes, they crease like a b!tch but you won’t want to be sat for 8 hours in a safari jeep under the African sun sporting denim, no matter how beige your jeans are. And, in terms of quantity, I’d recommend packing just a few items and rotating them. Beige and khaki aren’t my favourite colours so I don’t want to end up with 5 day’s of clothing in those colours. Also, it will keep your bag lighter. If you buy lightweight material, you should be able to wash and air-dry your clothes quickly. Clothing from most adventure/travel stores, while not particularly stylish, wins major points for practical properties like anti-wicking (sweating to you and I), lightweight, breathable and fast drying so keep an eye out for these technical clothing items which have been tested with lions. Probably. Some brands like Uniqlo also stock technical wear for a lower price. What I pack: I get a lot of my technical clothing from The North Face. It’s expensive but I have a fleece that I still use 8 years on. This isn’t the kind of wear I upgrade with seasonal fashions. Africa isn’t the kind of place you should work on your tan, not when you’re baking under the sun for several hours at a time. Cover up. 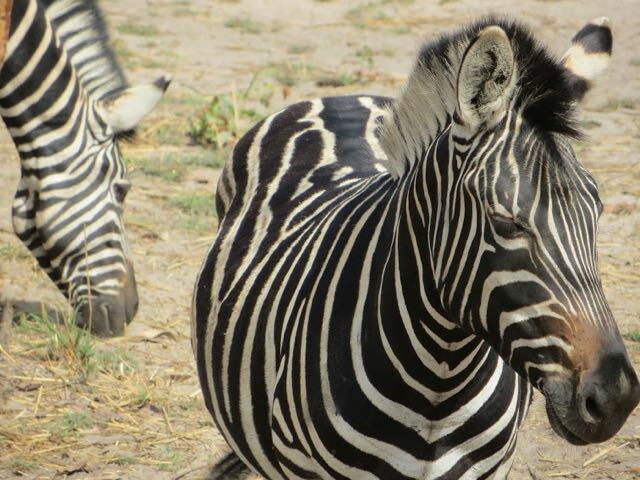 You don’t want to spend day two of your safari with heatstroke or blistering sunburn. Buying tip: Unless you’re spending money on technical clothing, I’d go for something cheap and recyclable. You’ll no doubt acquire unpleasant sweat stains (sorry but it’s true) and you’re unlikely to be keeping these tops for the long term. Think practical, not instagrammable. While oversized floppy designer head gear may get you more likes online, you won’t be able to see much. And neither will your travel companions. Opt for a cap. You can take it off for photos if you feel the need. Yes, this might seem obvious but I sometimes forget to pack them and I can get by in hot countries without them (I have whizzy contact lenses with UVA/UVB built into the lenses). However, on safari, with all that squinting and searching the horizon, you’ll want to keep your eyes shaded. Buying tip: Because of my wonderful contact lenses, I always buy very cheap sunglasses that don’t necessarily have UVA/UVB protection but if you don’t have lenses like this, make sure you protect your eyes. As my nan said, you only have one pair (eyes – not lenses). To run away from the animals. Actually, that’s bad advice – the good advice is don’t run, though I’m not sure my instinct is tuned into that. Fortunately, I didn’t have to test it. But either way, running shoes give good grip for bush walks as well as getting in and out of safari trucks. I personally think hiking boots are overkill for sitting in a safari truck. They’ll just make you hot but do check the level of any bush walks you might go on. For me, my running shoes were fine every time. Buying tip: You can read my article on the best shoes for travel here. What to buy: after trying many brands, I come back to Asics time and again. I usually buy whatever is on sale in my size at the time as the grip is usually good enough and they are typically lightweight enough for travel. Packing tip: use a shower cap to cover the base of your shoes. It will protect your clothes without adding bulk or dedicating a whole compartment of your bag to the mess of shoes. 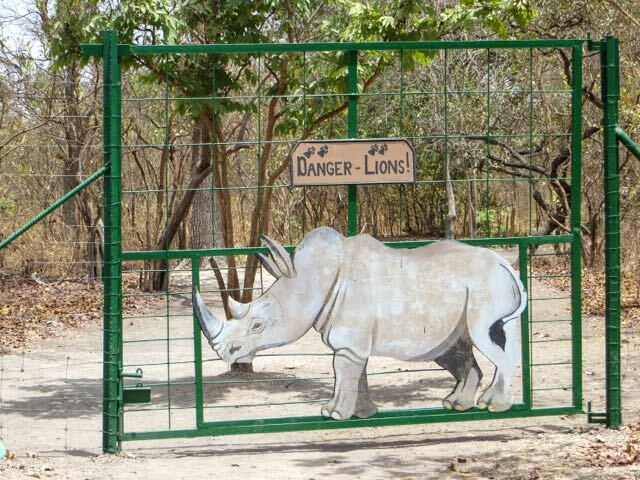 Camouflage gear is good – for a second I thought this lion was a rhino! I don’t know if the safari trucks ever had suspension built in but the ones I travelled in offered a very bumpy ride. If you need a sports bra to run, I’d recommend packing one for safari, lest you’ll be bouncing right out of your push-up. Although the African sun can be fierce, a sunrise or sunset safari can find you out in the cold quite quickly and you’ll welcome a lightweight but warm fleece. What I pack: I will never again stray from my fleece by The North Face. I tried one by Berghaus recently and within one wash it looks like I bought it fourth hand 12 years ago. My North Face fleece, meanwhile, looks brand new after 8 years. Buying tip: There are so many to choose from. I usually go for one with a zip (a bit more wearable in cities) and with a hood for extra warmth. Beyond that, I aim for the sale items because unless you’re arctic bound, any good brand fleece will add enough warmth. If you’re travelling in rainy season, a waterproof jacket will be a very good friend. Find one with inside pockets to protect electronics like your phone. What I pack: This is the one area where I never scrimp. I expect a lot from a jacket – I want it to keep me warm but not humid, to keep me dry, pack down small whilst having a hood and be durable when I drag it on adventures. I currently own a Hyvent jacket by The North Face. Frustratingly, they don’t sell it anymore. The Dryvent seems to be the closest match (and is the same pricepoint). Otherwise, the website has a filter. Look for something lightweight, breathable and waterproof. Ok, guys – read ‘travel wear’. The drive from Johannesburg was about 6-7 hours each way and with no animals to scare off, I opted for my favourite black jersey travel dress. Warm enough for an air-conditioned bus and comfy enough to sit in for endless hours. Also great for wearing around camp at night, but do check the situation with mosquitoes – trousers may be better. For the record, mosquitoes with even an average sized brain can bite you through leggings. Trust me, I’ve performed this human experiment more than once. Buying tip: You’re probably spotting a theme here but I usually opt for a high-street brand, cheap jersey dress that is thin and therefore quick to wash. Like longsleeve tops, these dresses only have so many travel miles in them so there’s little point going Gucci. Even my most budget safari lodge had a place to take a post-safari dip. Don’t forget your swim wear. Whilst entirely unsuitable for any game drive activities (ooh, look honey, I just stepped on a snake), having some around-camp footwear will be a nice relief at the end of the day. Buying tips: Again, my list of best shoes for travel will help you out if you’re looking for a new pair. 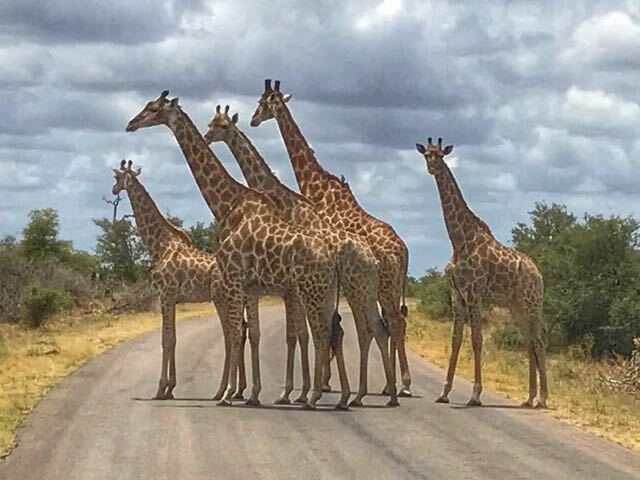 Apart from the giraffes above which very kindly trooped into the road, lined up for their photoshoot then wandered off, most animals are there then gone in the blink of an eye. For that reason, the camera and video on your phone might be best for grabbing quick pictures. The iPhone camera has gotten so good in recent years that I don’t always take my ‘proper’ camera with me any more. But I cursed myself for not packing it for my safari. There will be plenty of times when you’re sat in the safari vehicle some distance from a watering hole and the best way to capture the shot would be with a decent zoom lens. If you’re no DSLR camera enthusiast but own one of the big beasts, I’d recommend either shooting in auto (because what you really need to focus on is zoom and…er…focus). Otherwise, I love the Canon Powershot – the zoom and quality is phenomenal for a point and shoot. It also gives you some control over more advanced aspects if you want to level up. I used to own one before I upgraded. I then bought one for my dad when we went to Asia together and his photos beat my iPhone photos hands down. My ‘proper’ camera at the moment is the Sony-Nex (now Alpha), which I love for the superior image quality together with it’s compact size. This CSC (compact system camera) will fit in my bag. But, I’m honestly contemplating going back to my Powershot. What I pack: Sony Nex (now the Sony Alpha). My safari accommodation was up a tree so I wasn’t surprised that I didn’t have a charging point in my room. Having a portable battery charger gave me that extra bit of juice when I needed it, without being tethered to the main reception area. Also useful when you’re out for a long day of animal spotting. What I pack: Anker ‘lipstick size’ charger. It’s small yet gives me 1-2 full iPhone charges. I’ve tried other brands and this is by far the best (IMO). Buying tip: if the lining of your bag is black, go for a bright colour so you can find it easier. I have the blue one which is vivid enough. If you’re packing a ‘proper’ camera, consider taking a spare battery. They’re relatively cheap and small to pack and there’s nothing worse than lining up what is an increasingly rare picture of a black rhino only to have your battery fade to nothing. You’re going to take a lot of photos on safari and next to having your battery drain, having a ‘Memory full’ message just as that male lion yawns will having you kicking yourself for years to come. What I pack: I use a San Disk SD Card and wouldn’t compromise, having lost photos from a cheaper non-branded card. Having lost my trip photos more than once, I can’t talk more passionately about the need to back-up, back-up, back-up. If you’re travelling with a laptop, also pack an external hard drive. You’re unlikely to have good enough/quick enough wi-fi in your safari lodge to upload photos to the cloud so an external hard drive will give you the back-up you need. What I pack: For years I’ve relied on the Seagate Backup plus 2TB external hard drive and it’s not failed me yet. This probably should go on the ‘of course I’ll pack that’ list but, of course, I forgot mine and it was the single biggest frustration every time I came to charge my gadgets (yes, I bought one locally but the quality wasn’t great). What I pack: As an Apple junkie, I carry the Apple World Travel Adaptor kit, which I love. Otherwise, a multi-country adaptor is always a good item to own and travel with. Try to get one with USB ports like this one. If you want to charge more than one gadget at a time (phone, camera, laptop, e-reader, portable battery), pack a travel power strip. That way you won’t spend your whole night rotating gadgets and apologising for hogging all the plugs. Buying tip: again, try to get one with USB ports and beware of cube designs. Sitting one of these in an existing strip can cause trouble with the neigbouring charging plugs. A strip like this one is a better design. You may or may not want to pack binoculars. 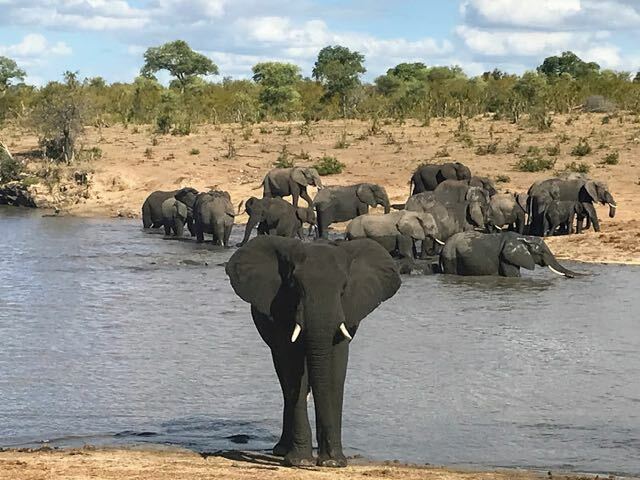 Someone had a pair when I stayed at a wonderful hotel in Zimbabwe overlooking a watering hole and I could have spent all day looking through them…except they were not mine and I had to give them back. Nobody had a pair in my safari truck, which was a shame because there was apparently a cheetah in the distance that we couldn’t see with our eyes alone (was it a cheetah, was it a cheeto?). Pack a pair and you’ll enhance your safari. You’ll also become the most popular person in your safari jeep. Buying tip: unless you’re a serious enthusiast, a small, cheap set of travel binoculars like these ones will be a good choice. Reference earlier story about flinging iPhone under treehouse and near miss with snake. 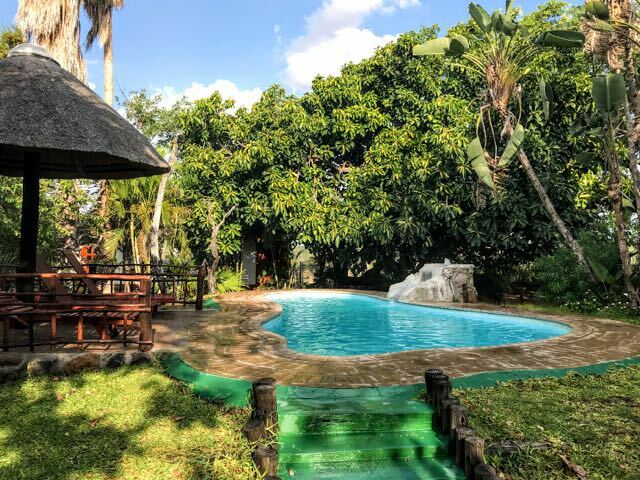 At one of my safari lodges I was located quite a distance from the main lodge and restaurant. A head torch would have been far superior to my iPhone torch. Not only was I juicing my battery (for my only camera), a head torch is more stable and can’t be thrown on the ground during a moth attack. Buying tip: I bought an expensive Petzl torch and it’s not all that great. If I was shopping again, I’d get something cheaper and more basic like this one. I’d packed the wrong clothes, forgot my torch and left my camera at home, but I had my corkscrew, so that was ok. But seriously, I pack my Swiss army knife on every trip (where I have checked baggage). From sawing up baguette to opening wine to plucking my eyebrows to cutting my wrists free when I’ve been captured by monkeys who are intend on eating me, it’s very useful to pack. What I pack: I’ve bought this Victoriknox knife twice (lost one) and I’d buy it a third time if I misplace it again. The unfortunate reality is that you’re going to chug through a lot of plastic water bottles on safari. The tap water won’t be potable and unless you really are an Indiana Jones, you won’t want to treat then drink the local water – you may have killed the bugs but I can promise you it won’t taste good. Not when you need to drink litres of it a day. The best you can do is see if there is a bigger water bottle you can refill from and pack your own refillable bottle. Buying tip: I picked a collapsible, refillable water bottle for £1 in…guess what…a £1 shop in the UK (a dollar store in the USA). However, there are plenty on Amazon if you want to read reviews to make sure you get one that doesn’t leak. If you’ve got a long journey to your safari camp, packing a book or e-reader will help kill the time. Also useful for reading at night if you’re at a ‘lights out early’ kind of lodge. I particularly like my Kindle Paperwhite in these scenarios because I can switch off the light in my room (thus not inviting mosquitos and bugs to visit) while still reading by the in-built backlight. What I pack: One of my all-time favourite travel possessions – my Kindle Paperwhite. Buying tip: if you are buying a Kindle or e-reader for travel, make sure you get one with a backlight. Some of the cheaper models don’t have one and you’ll really want it for night reading on buses, planes and trains. Let’s start with what you’re not going to find on this list: make-up or jewellery. Safari and perfectly blended foundation just don’t mix. If the sweat doesn’t melt off your make-up, the air and dust will sand-blast it to nothing by the time the sun is up. 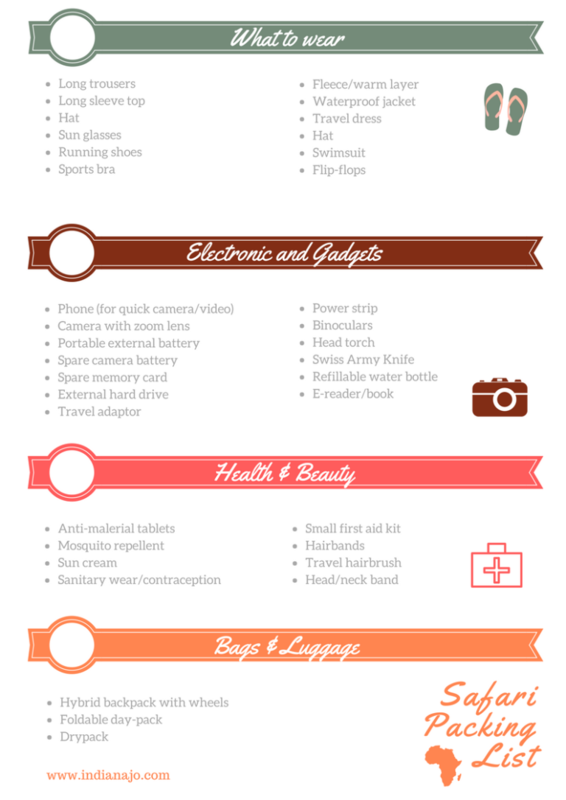 What is on this safari packing list is the health and beauty essentials your might not pack on your usual trip. If you’re on safari in Africa, the chances are, you’re going to be in a malaria zone. 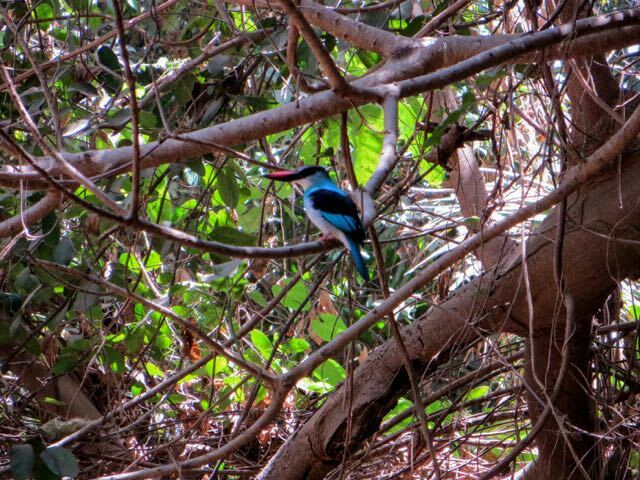 There is a small area within the south of Kruger National Park where there isn’t malaria but from what I read there aren’t many animals either. This is my go-to website for checking whether I’m going to a malaria zone. In the UK, you can self-prescribe malaria medication. I did it online using Superdrug and had my pills within 48 hours of buying them, albeit at an inflated price. I opted for Malarone. It’s the most expensive option but you take it for the least amount of time and it has the fewest side-effects. Make sure that the pills you choose are suitable for the area you visit – some types have become resistant in some areas. I’m a mosquito magnet and I’ve tried almost every repellent under the sun before concluding that something close to 100% DEET is all that works for me. So, I buy and apply something close to a chemical peal. It’s horrible for your skin even when I dilute it with body moisturiser, but it mostly does the trick. What I pack: You can find out more in my post about the best mosquito repellent. Although I use high DEET, I wouldn’t recommend it unless you absolutely have to. There are milder alternatives available which I also recommend in my repellent post, above. Factor 30 or higher is my recommendation. I tan quite easily for a pasty British girl and still I slather on my factor 50. Africa is hotter than you can imagine and the safari trucks can add a deceptive breeze. 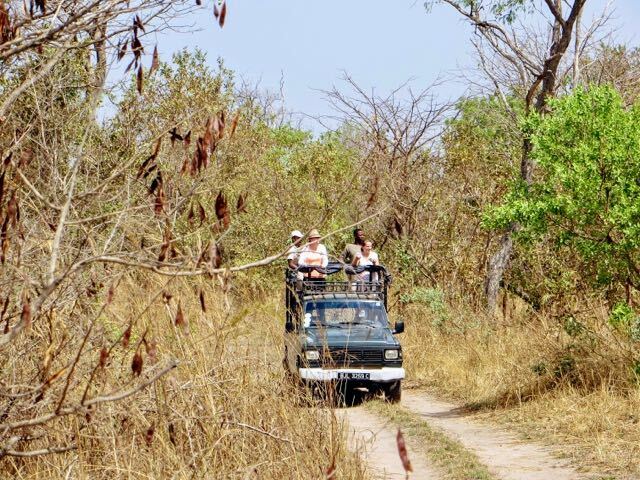 There will probably be a few opportunities to stop at gift stores to replenish snacks and drinks on your safari, especially in a big park like Kruger. However, I wouldn’t expect to be able to pick up any essentials like sanitary wear or contraceptives. Pack what you need. By small I mean small. Read some sites and they will tell you to pack your own syringes and bandages. The reality in my experience (which has included more than one trip to a doctor/hospital) is that if you need extensive medical treatment that requires stitches/bandages/syringes, you’re probably travelling straight to hospital not back to your room to pick up your chest of fist aid items. Otherwise, all countries have pharmacies and Africa is very well educated on the need for sterile needles. I don’t travel with any anti-diarrhoea pills. If there’s a bug in my stomach, I want to let it out, as unpleasant as that is. I know this is not ideal if you’re on a safari truck all day so you may think differently. However, I tend to pack some more natural items like marshmallows that are known to add a bit of ‘gelling’ to your stomach without stopping your toilet trips entirely. This list might also help. I also eat a lot of pro-biotics before a trip (yoghurt mostly) and pack peppermint pills to soothe any low-grade troubles. What I pack: a small travel pill box like this one lets me fit most of my essential items into a small pack. A lot of safari trucks are open-sided and at the end of a long game drive, you’re unlikely to be able to get a brush through your hair even with it tied back. Go for braids and you stand a much better chance of not having to cut the knots out. I don’t know about you but my head gets sore if I have too many knots in my hair. Also, who wants to look like a cave lady when they sit down to lunch/pose for a photo? At toilet stops I pull out my travel hairbrush and keep my long hair under control. What I pack: I love my round folding travel hairbrush that includes a mirror. I’ve had it for about 3 years and it’s still going (I have given it a good clean in between, don’t worry). Avoid hair problems, protect your head from the sun and/or keep the dust from your throat with a multi-function head/neck band. This is one of the items I really regret not having on my safari packing list on my last trip. See here for my full health and beauty packing tips. All Nellie the Elephant packed was his trunk. Be like Nellie. Pack light. Let’s face it, whatever luggage you already have will probably do. If you’re on an organised safari, there will be people to help with your luggage. There is no need to add to your travel costs by throwing down for a new bag. I’ve dragged a suitcase across sand before. It’s not ideal, but it didn’t ruin my trip. However, if you want to make life easier on yourself and those around you (or you just want an excuse for new luggage – pretty much me on every trip), I’d recommend a hybrid backpack with wheels. I travel with the one below. The size prevents overpacking but isn’t too small that you can’t fit in what you need. Most of the time I wheel it along but on the odd occasion (sand and safari), I can whip out the backpack straps and carry it like that. The case is both rugged and lightweight making it perfect for safari. What I travel with: I recently bought and fell in love with this Kathmandu Hybrid 50L Trolley. It’s a pain because it’s not a UK (or US) brand (it’s from New Zealand) so it can be hard to come by but it’s worth tracking down. I found mine on Amazon. Packing tip: The most important thing is to pack light. Pick a bag or suitcase than holds under 60 litres (slightly bigger than carry on but smaller than a full-sized suitcase) and you’ll do yourself a huge favour. I love these small bags – they are cheap, lightweight, pack down very small and can fit a lot when they’re unfolded. With one of these, I can leave my usual backpack/daypack (usually containing my passport and valuables like my laptop) fully packed in my room and just throw the things I’ll need that day into my bag. What I pack: The first foldable backpack I bought was pretty expensive. These days I opt for a no-brand version because if you look closely, they all seem like they’re made in the same factory. My current version looks like this with a slightly different logo. If you’re travelling in wet weather, you’ll definitely want to pack one of these to keep your electrical items dry. But in all seasons, these sealable bags can keep animals away from any snacks you store in your room. What I pack: As I’m not a diver, I go for a lightweight dry bag and usually buy a pack of three like these ones. That’s my safari packing list. You can find a printable version of it here. Got any questions? Let me know in the comments below. So helpful! we’re going on our first safari this year – sounds like it will be right around a year after yours. We’re headed for South Africa just after Christmas. Can’t wait! Thanks for the tips. 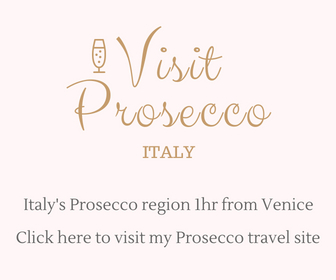 I also read your suggestions for new travel bloggers and really appreciated those tips, too! Hope you have an amazing time. Glad you liked the posts. Safari are amazing. I love to do it. Thanks for sharing. It is very helpful.